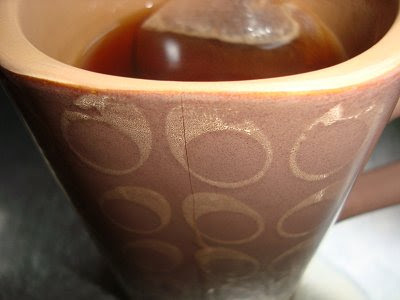 It's never a good day when your most favourite mug develops a hairline fracture... especially when that particular mug is also no longer available anywhere! So a big thankyou to Sewfunky for sending some joy my way in the mail! Both Mandrake and I were super excited as we opened her box full of fabric and books!! A while ago I won 7 fat quarters in one of Sewfunky's giveaways. I am looking forward to using them. One idea for them that I saw was this Procrastination skirt at The Small Stuff. Cool aye. 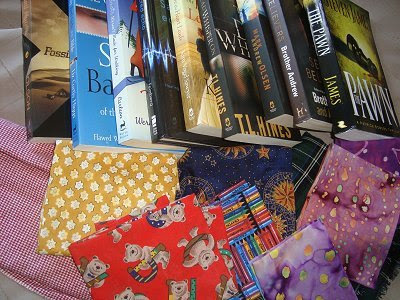 Sewfunky has also generously sent us tons of books (also thanks to Manna Christian Stores) to read and review on Flannelgraph. So check out Sewfunky's blog here. She is one clever lady who also has a blog for Gluten Free recipes (here) and one for everything Retro (here). It's ok I've checked my cup , whew! Thanks for the visit , great to hear from you . Wow how sweet is that! Looks like a top mail day - fabric and books - does it get any bettter? Would you believe it only cost around $3.50 to send you all that stuff by courier!! Ooooooo. I have mail-envy! Nice treat alright!